The helmet was made exclusively for this weekend’s game, the first in the 2011 Adidas Football Shamrock Series, and won’t be worn again until the 2012 Shamrock series. To promote the game, Adidas Football created limited edition Notre Dame boxes which contain the special Adidas-created Notre Dame uniform, the helmet and other cool stuff like an iPod Nano and a golden dome glass vial. Only 11 of the limited edition boxes were made. So, why’d Adidas pick Troy Lee? Well, there really isn’t a more respected name in custom helmet paint and design. 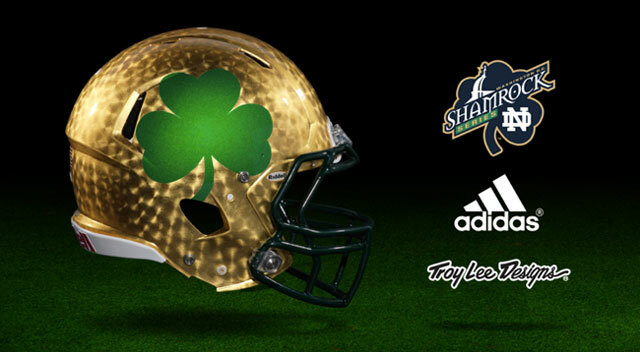 And for these Shamrock Series helmets, Troy Lee Designs did some seriously custom work. You can get a taste for what that means in this video. We’ve been doing photography for Troy Lee Designs for years, and their work never ceases to amaze us. Every helmet is more bold and innovative than the one before. And, we’re not the only ones who think so. TLD helmets have been worn by some of the greatest racers in the world. It seems only natural then for TLD to create a helmet for one of the most iconic football teams in history. We won’t be shocked if Notre Dame’s running backs seem to be running a bit faster than normal tomorrow. You can see the Shamrock Series helmets in action on tomorrow’s game on NBC, starting at 4:30 p.m. PST.